It is important to have a transparent model in place so that students can mark progress through their study of mathematics. MATHguide provides a suggested framework absent of confusing jargon. The Parkland Shooting: Due to Obama-Era Policy? The closer you look at the school shooting in Parkland, Fla., the more you realize that it might have been one of the most preventable significant crimes in recent American history. Did an Obama-era policy designed to reduce the “school-to-prison pipeline” prevent police from using available tools that could have stopped the shooting? Something needs to be done! But, what? A thorough look at school shootings reveals several important facets of the problem. For people who want to solve the issue, this is a must read. Chicago is suffering from a violent crime epidemic and experts have reported that it will increase during the 2017 year. Read this brief report that paints a clear picture as to the reason for this pervasive crime problem. With the passage of the Affordable Care Act, everyone with a stake in the $3-trillion-a-year health industry came out ahead -- except the taxpayers, says author Steven Brill. See this important interview by Leslie Stahl of 60 Minutes. Mark Liberator attended the event, captured photos and reports. Mark Liberator writes how the highest court views the 2nd amendment. What type of world would we live in if freedom of speech and satire were abolished? We would live in squalor, be victimized by zealots, and women would live in misery. This is the world Muslim extremists are begging to propagate. Learn how closely satire is linked to a free society by CLICKING HERE. Chicago and its suburb Cicero have unfortunately grown synonymous with crime, gangsters, and bloodshed. 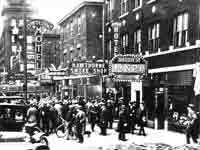 Gangsters such as Al Capone, Buggs Moran, and John Dillinger paved a path for Chicago and Cicero that was brutally violent, unlike the romanticized portrayals of characters within a variety of Hollywood films. This site on gangsters will exist as a chilling reminder of this criminal scourge. Learn more about Gangsters in Chicago and Cicero by CLICKING HERE. Without action to reduce the national debt, the U.S. economy will be a train running with the handbrake on. Get information about what you can do to reduce the debt by CLICKING HERE. The Liberator invites you to learn about the horrors of governments that have killed civilians. More than 100 million non-combatant lives have been extinguished in the 20th Century alone due to rogue regimes. Please visit the site: CLICK HERE. The Liberator supports satire, freedom of speech, and tenacity. Charlie Hebdo's decision to continue production after being attacked by Muslim extremists deserves special praise. Please visit the site: CLICK HERE. The Liberator would like to help you protect your gun rights. The next time your senator or congressperson must entertain a bill that affects your second amendment rights, send a letter so that you are fairly represented. We have prepared a document to assist gun owners, civil rights advocates, and patriots across the land. View a hypertext (HTML) and a rich text (RTF) version of the letter. It's free for non-commercial use, compliments of The Liberator. The Liberator does not advocate any particular philosophy or worldview, save to promote freedom of speech and an informed, self-governing global citizenry.